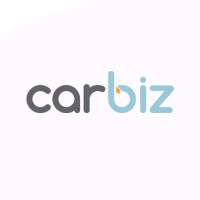 At carbiz, we’ve removed the confusing tiers of coverage and only offer the best plan on the market. 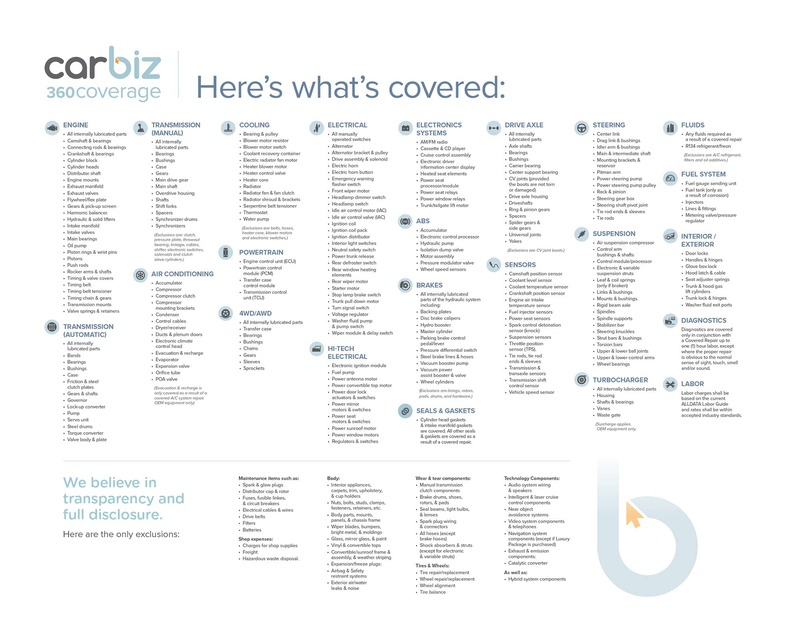 Our comprehensive 360 coverage is comparable to the manufacturer’s basic warranty (often referred to as bumper-to-bumper) and covers just about everything—with only a few exclusions. Our nationwide network of service facilities gives you the freedom to travel anywhere in the country, worry-free. Call us anytime, anywhere and we’ll be there to assist. 5 years / 100,000 miles. *RENTAL CAR COVERAGE: In the event that a Covered Repair requires labor in excess of eight (8) hours, We will provide rental car reimbursement of no more than thirty-five dollars ($35) per day for a total of no more than five (5) days, not to exceed one hundred seventy-five dollars ($175). Delays caused by unavailability of parts, shipping, and repair facility schedules, or other factors do not qualify for rental car reimbursement. *TRANSFERS: This Contract is transferable one time and for the duration of the original term to a subsequent purchaser of the Vehicle upon our receipt of a written transfer request from you within thirty (30) days of the sale or transfer of the Vehicle. There is a transfer fee of one hundred dollars ($100). This Contract cannot be transferred to another vehicle. *ROADSIDE ASSISTANCE AND TOWING: • TOWING: The roadside service provider will tow the Vehicle to the location of Your choice within ten (10) miles of disablement, or if greater than ten (10) miles from disablement, to the nearest dealer or licensed and reputable repair facility. TIRE CHANGES: The roadside service provider will come to the Vehicle location and replace a flat tire with Your inflated spare. Repair or replacement cost of the tire is Your responsibility. • FLUID DELIVERY: The roadside service provider will come to the Vehicle location to deliver normal types of emergency fluids needed to get the Vehicle to the nearest service facility, i.e. gas, oil, water, etc. Cost of gas, oil, etc. will be Your responsibility. • LOCKOUT SERVICE: The roadside service provider will come to the Vehicle location to unlock the doors of the Vehicle or provide assistance if the key is lost or broken. Key replacement cost is Your responsibility. • DEAD BATTERY JUMP-STARTS: The roadside service provider will come to the Vehicle location to jump-start a dead battery.